Custom embroidered ivory cream hand towel made unique with artistic chrysanthemum flower and birds each side. Custom embroidered ivory cream hand towel made unique with artistic chrysanthemum flower and birds each side. Useful gift for home, bathroom or even as a pretty gym towel. Popular for birthdays, Mothers Day or an anniversary gift. Custom embroidered ivory cream hand towel made unique with artistic chrysanthemum flower and birds each side. Useful gift for home, bathroom or even as a pretty gym towel. 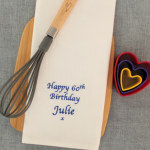 Popular for birthdays, Mothers Day or an anniversary gift. 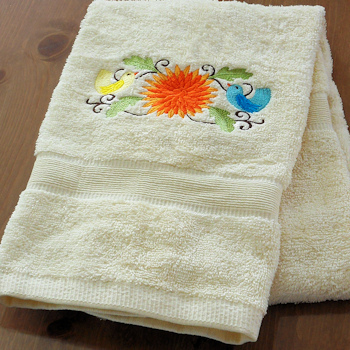 This embroidered hand towel is soft combed cotton 500gsm. Measures 49x90cm.